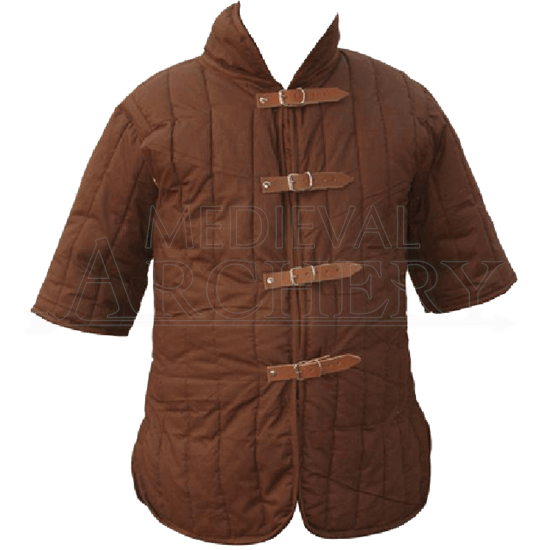 This padded gambeson is perfect for LARP, the padding is more on the light side, so it is better for leather armour or light steel armour. The sleeves are a half sleeve length and the underarms are designed with holes which provide ease of movement and good ventilation. The gambeson has strap and buckle closure up the front and a stand up collar. This is a well made item, but unless you are a very small person or 12-14 year old, you may want to choose a different gambeson as it is quite small even for me at 5'9" and 135lbs. For the average person another gambeson may be a better choice. It advertises up to 38" chest size, probably closer to 34"-36" would be more accurate.